The family will greet friends starting at 10:00 am. Robert "Bob" Louis Windich, 93, husband of E. Ann Thomson, died Tuesday, June 20, 2017. Bob was born on the Southside of Chicago "Back of the Yards" to Austrian parents. 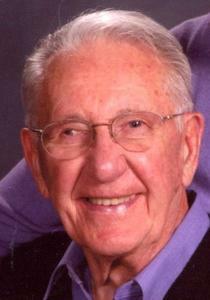 Bob served in the U.S. Army in the South Pacific during World War II as part of the Greatest Generation. Through the Army, Bob studied at Harvard for a brief time. Bob retired from condominium and apartment complex building maintenance in Chicago and Naperville, Illinois. Bob married E. Ann Thomson in 1985 in Chicago after a long and beautiful friendship. Ann had vacationed at Glen Lake when young, and in 1989 Bob and Ann moved to their special place there. He was a good man! He is missed. A memorial Mass will be held at 11 a.m. Wednesday, June 28, 2017 at St. Philip Neri Catholic Church in Empire. The family will greet friends one hour prior. To honor Bob, donations may be made to the Grand Traverse Veterans Coalition, an all volunteer organization.